Promote your business and improve sales with targeted marketing campaigns in Dynamics 365 for Sales. 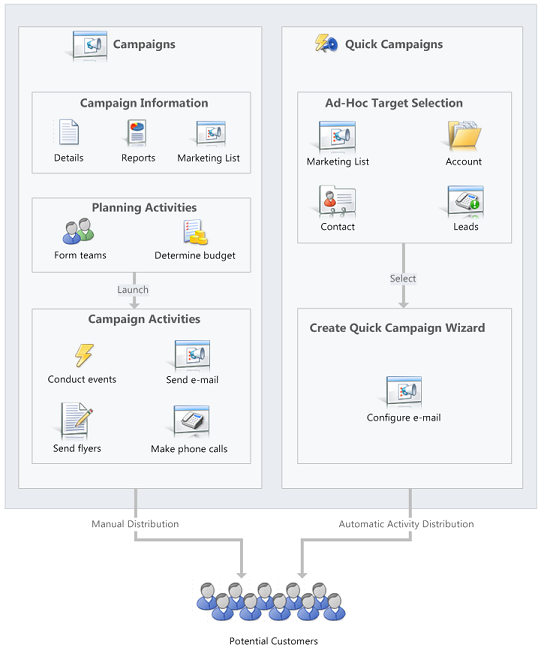 Create activities for each campaign and assign them to different team members. Track customer response and costs for each campaign. Follow this step-by-step guide to get started with your marketing campaigns. In the marketing area, use standard campaigns to manage the end-to-end process of a complete marketing campaign, like managing campaign and planning activities, distributing the activities to other team members, and tracking how the campaign did. Campaigns include extensive tracking features, including detailed information, reports, and multiple marketing lists. In contrast to standard campaigns, use quick campaigns to automatically distribute a single activity to selected accounts, contacts, or leads, or to a single marketing list. The effects of a quick campaign are immediate. Campaign Activity Status: Use this report to track a campaign. The report displays a summary for one campaign. Campaign Comparison: Use this report to identify your most and least successful campaigns. Campaign Performance: Use this report to track the progress and status of your campaigns. You can enable customers to unsubscribe from email marketing communications your organization sends them. Note that you cannot add unsubscribe functionality to direct email or email templates.